Mapping technology offers you the potential to visualize your market like never before. 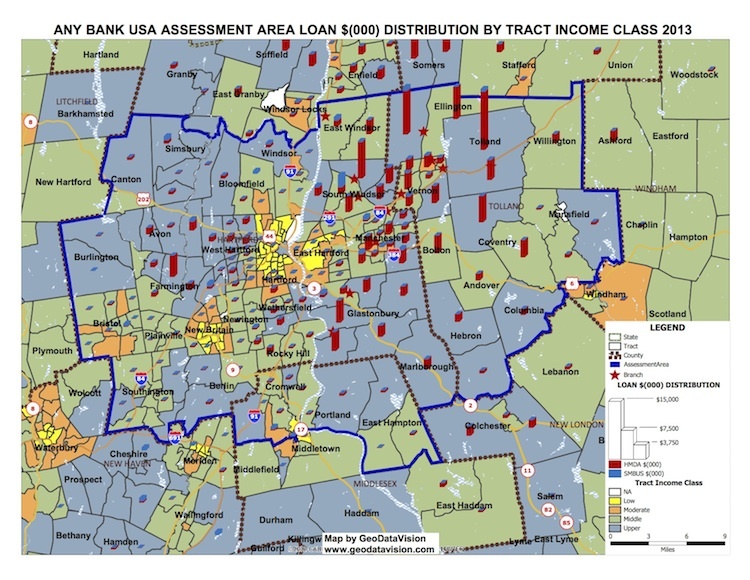 Mapping creates geographic pictures of your loans and deposits as well as competitor loans and deposits and branch locations. These "data pictures' allow you to see and understand your markets like never before. Even more exciting, by combining mapping with GoTo Meetings any bank today, big or small, can enjoy the advantages of mapping their markets. 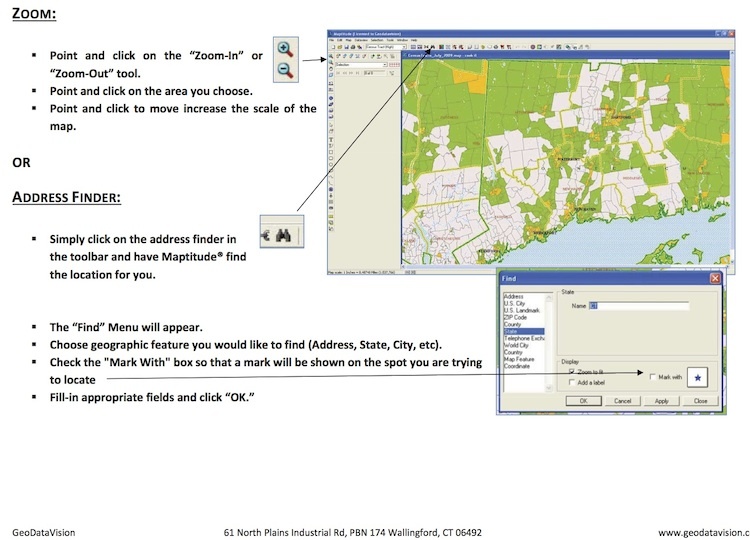 Learn more about GeoDataVision Live Mapping Services. 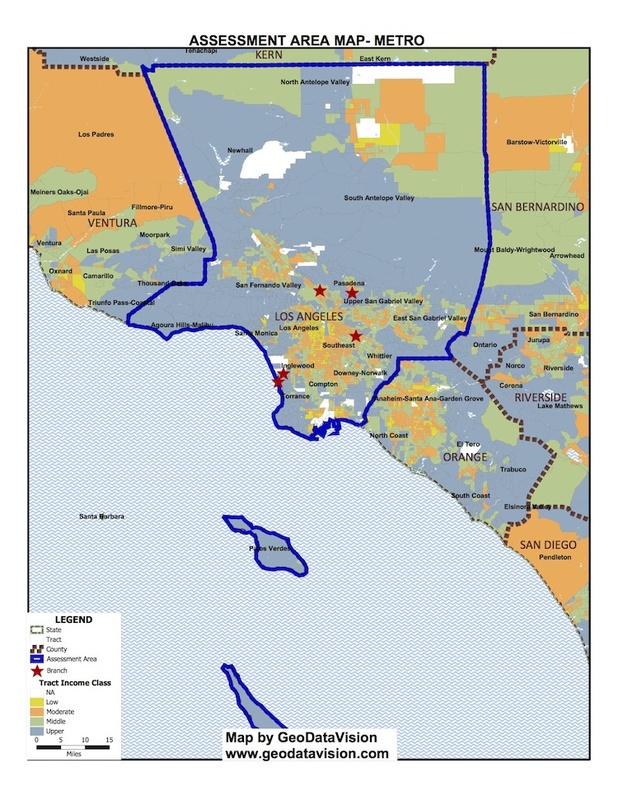 Assessment Area (AA) maps include the delineation of your Assessment Area boundaries, key towns and cities, major roads, census tract income classifications (color-coded) and branches. The map meets all regulatory standards for your CRA Public File. Depict your bank’s lending in and around your Assessment Area. 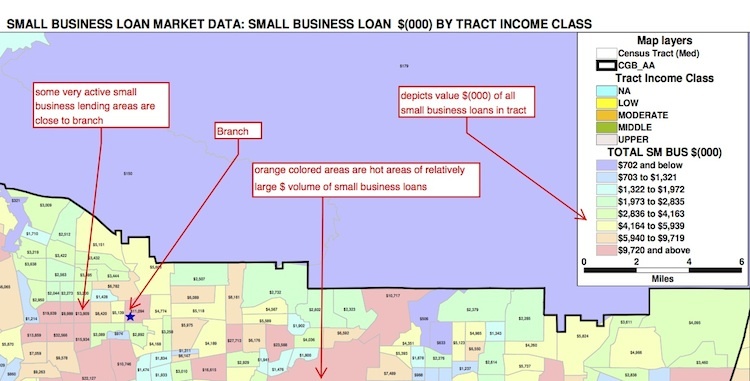 "Single theme" and "double theme" maps display your lending activity (dollars and units) to reveal the geographic dispersion of your small business and mortgage lending. GeoDataVision creates maps of geographic areas (bank AA, county, etc.) and displays the market data (Small Business or HMDA) in units and dollars. 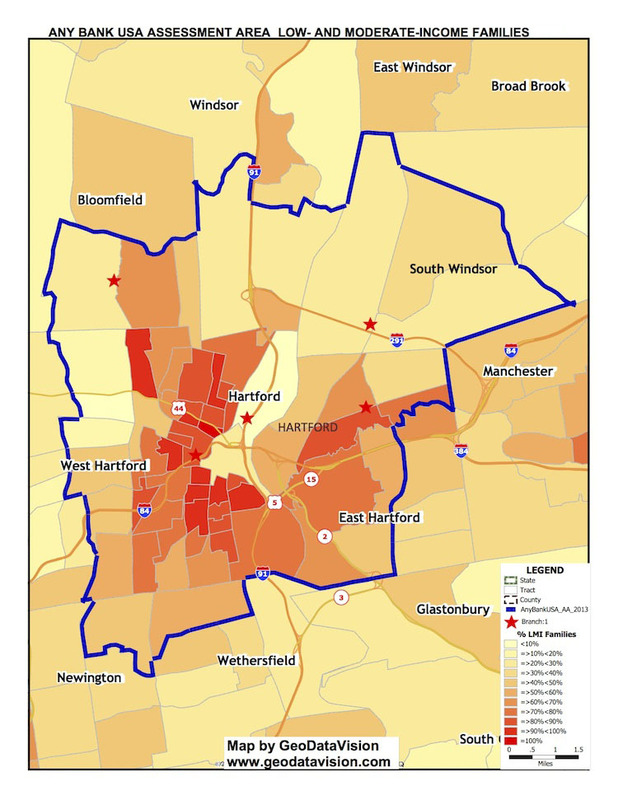 The maps provide a geographic image of local mortgage and small business loan markets. 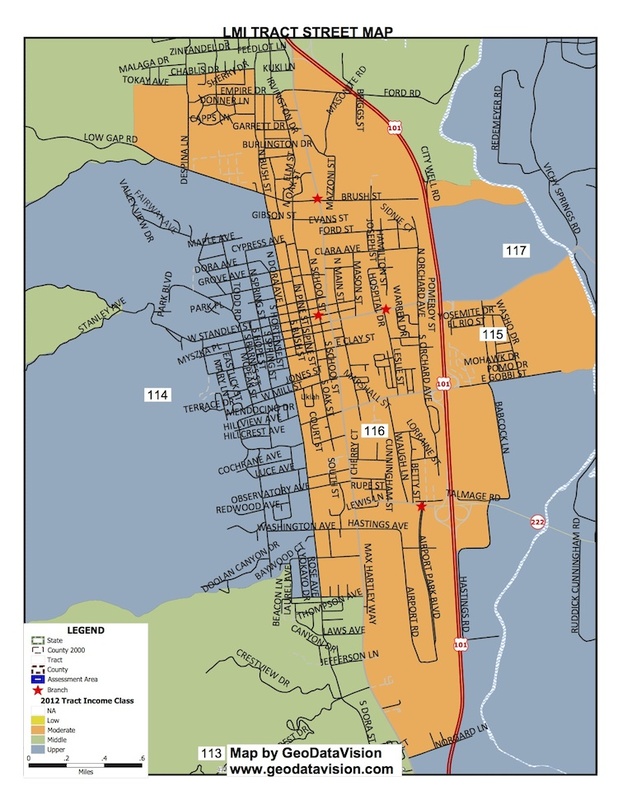 These maps are created to show street level geographies for analyzing tract boundaries, especially LMI Tracts. 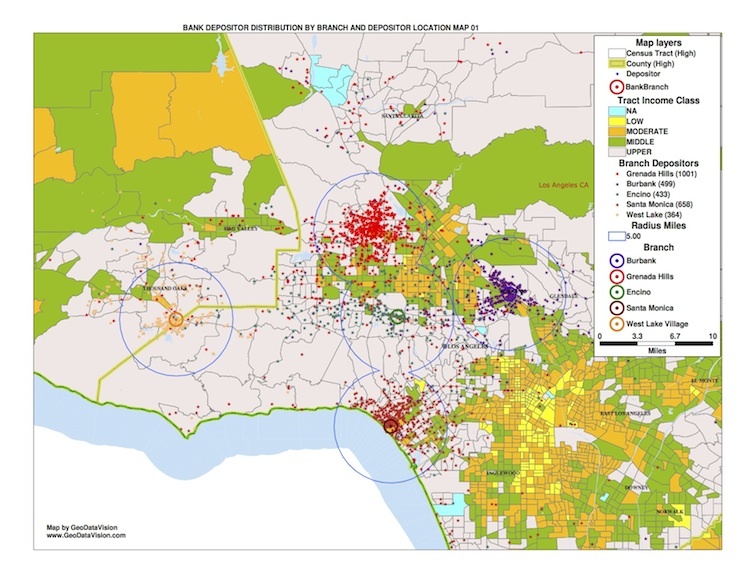 We can capture demographics, such as Minority Populations, and display them in layered screen colors for visual analysis of their location and size. 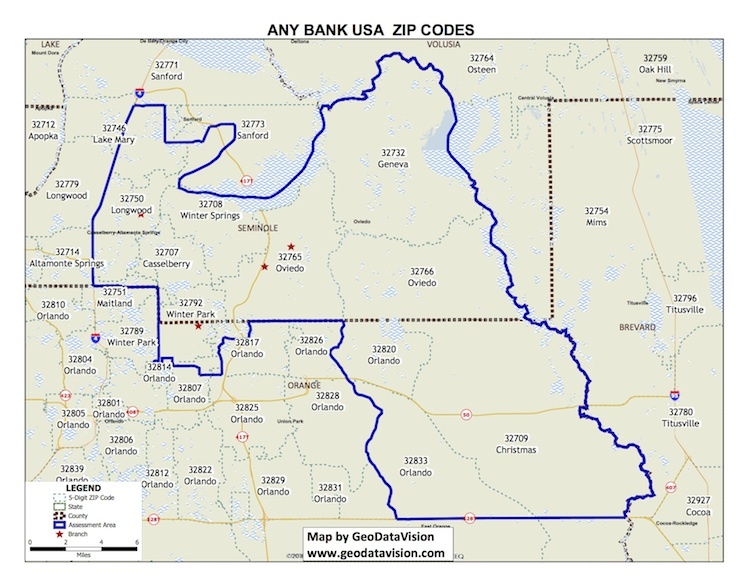 Another use of AA Maps is to overlay zip code boundaries on them along with zip code numbers, for identifying their location in proximity to tracts, towns, counties, etc. This is another way to take advantage of sophisticated computerized mapping with minimal or no skill. 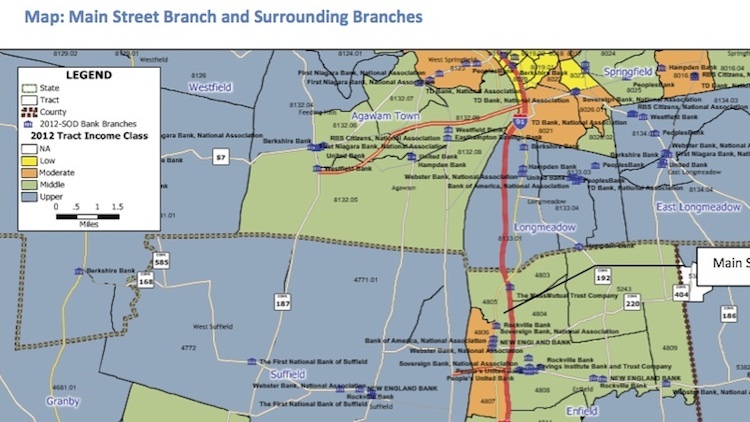 Maps of deposits and depository branches included in the annual Summary of Deposits (SOD) data released by the FDIC. Maps for analyzing variables in determining the effects of closing a bank branch.